In 2012, for the first time ever, Herring Run Nursery was a vendor at the 25th annual Baltimore Herb Festival. We grow and sell native plants primarily for their wildlife value and pollution reduction merits, but it turns out that many native plants are edible or medicinal to humans as well. Sweet goldenrod, sometimes called blue mountain tea, has a rich history. Long before the ­arrival of Europeans, the Native Americans so appreciated its taste that they flavored other medicinals with it. 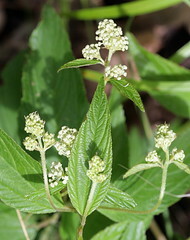 After the Boston Tea Party in 1773, patriotic colonists devised a substitute for China tea called Liberty Tea, made from equal parts of sweet goldenrod, betony, red clover, and New Jersey tea ­(Ceanothus americanus). Later, sweet goldenrod became a cash crop in the United States; it was even exported to China, where it sold at high prices as a tea ­substitute. There are many others, so I recommend checking out a book like Peterson’s A Field Guide of Edible Wild Plants of Eastern and Central North America or something similar for more information about preparations, toxicity, and additional ideas. If you are interested in consulting with one of our staff on edible native plants for your rain garden or home landscape, I suggest you contact Stuart Campbell (410-254-1577 x106), our resident expert on the topic. The nursery will be open again on June 2nd, and meanwhile we hope you’ll come out to the Baltimore Herb Festival on Saturday. And be sure to save the date for Berry Festival, our salute to the king of native edibles, on Saturday, June 23rd from 11am to 3pm. The native berry dessert competition is not to be missed–and you can even submit an entry yourself!